Blend of three recipes, one aged 18 years; the other two, 13 years. The second limited-edition bourbon to mark Four Roses’ yearlong celebration of its 125 years in distilling is this uncut, non-chill-filtered small batch bourbon (the first was the single barrel released in the spring). Master distiller Jim Rutledge mingled three of Four Roses’ 10 recipes to create this barrel-strength bourbon: an 18-year-old selection of OBSV (delicate fruit, spicy and creamy characteristics), a 13-year-old OBSK (rich in spiciness, full body) and a 13-year-old OESK (spicy, full body). About 8,000 bottles will be distributed in September; Four Roses kindly sent me a small sample for this review. 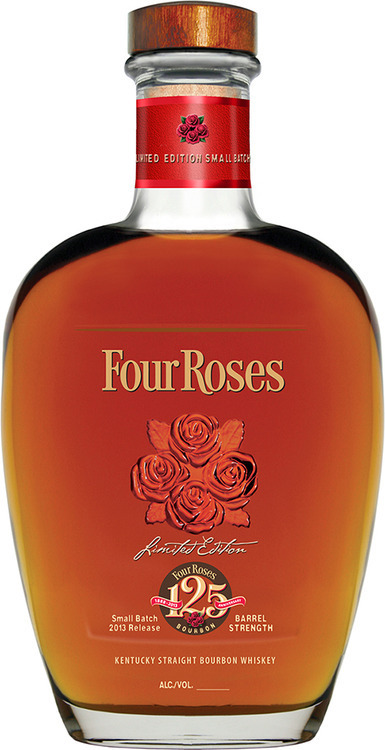 Nose: Vanilla; a little more wood aroma than usual for Four Roses – almost cedar; smoke. Taste: This bourbon doesn’t spend much time in the middle of the palate. A tingle of alcohol on the very front quickly dissipates, returning to bloom into a long, warm finish. The vanilla from the nose is joined by dried cherries, cinnamon and a hint of tobacco. The mouthfeel is very creamy, and you can tell the juice hasn’t been chill-filtered: This is a “thicker,” chewier Four Roses than I’m accustomed to – and that’s a good thing. The long finish coats the back of your throat like syrup, leaving a hint of mint. Verdict: Happy Anniversary, Four Roses. This Small Batch is a fitting present: It’s much more complex and delicious than the limited editions of the previous two years (and they weren’t exactly slouches – the 2012 issue was named American Whiskey of the Year by Whisky Advocate magazine). As noted above, this bourbon has a heavier, smokier presence than any Four Roses product I’ve sampled, but there is nothing harsh about it: The heavier qualities are balanced by the creamy vanilla and the sweet-sour cherry notes. I’m going to keep this around for the winter: With its warming finish in the back of the throat, the 2013 Small Batch may be the perfect prescription for the common cold.